AUSTRALIAN FORWARD Mitch Achurch will leave Leeds Rhinos at the end of the season, he has revealed. Achurch’s contract expires this autumn and he confirmed the club have told him he will not be kept on. 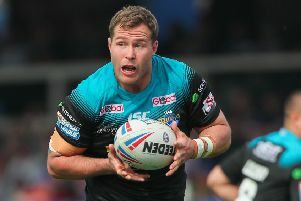 He is considering whether to stay in Leeds to run his new business or return Down Under – and is aiming to bow out of Rhinos with some good form under his belt. The 27-year-old joined Rhinos from Penrith Panthers on a four-year deal ahead of the 2013 season and was a member of last year’s Challenge Cup-winning team. Achurch has played 69 games for Leeds, including four this season, but a succession of injury set-backs have prevented him from building a consistent run of appearances. “I am off contract, but I got told last year I won’t be at Leeds after this season,” Achurch confirmed. “I knew this would be my last year at Leeds. “There’s no contract talks with Leeds at the moment, so I’m a free agent. Achurch’s partner – who recently gave birth to their first child – still lives in Australia, where she runs her own business. She has been jetting to and from England since Achurch joined the club, but he has now opened the Implexus gym in Armley – with former Leeds player and current member of the conditioning staff Ian Kirke – and has not yet decided whether to stay in England or return home. “That’s a decision I am going to have to make when it comes to it,” he said. “The last time, when I made the decision to come to Leeds, I made it on my own. “Now – three years later – I have got a kid to think of, so if and when some offers come in I will have to sit down with my missus and talk it through. “It sort of feels like I have started this gym, I am really enjoying it and I can’t leave it until it’s self-sustainable. Rhinos’ squad have been using the Implexus gym after their own facilities at Kirkstall were destroyed by flooding on Boxing Day. Achurch began the season playing on dual-registration for Featherstone Rovers, before being recalled by his parent club. Rhinos, who visit Salford Red Devils on Saturday, are second from bottom in First Utility Super League, with just two wins from nine rounds. Asked what needs to happen for last year’s treble-winners to get out of their current rut, Achurch said: “I’m not sure. “I think the coaches will have to put their heads together and come up with something as we’re at that point now where we’re obviously ripping in at training, doing what we’re told. “Everyone is trying and no-one seems to be slacking off, but it’s just not clicking. Wigan will be without forward Liam Farrell for Sunday’s Super League game at Wakefield Wildcats after he accepted a one-match ban. The England second rower was charged with a grade B offence of striking Warrington’s Stefan Ratchford with his knees during his side’s 28-16 home defeat by the Wolves on Friday night.